In the last few years I’ve been trying to learn more about the moths we have at the farm. Since moths fly mostly at night, I’ve been using both bait and lights to attract them so I can get a look at them. Here are explanations of the techniques I use. Bait is a fermenting, sugary mixture that mimics tree sap. Many moths eat tree sap, so if the bait is painted on trees, they’ll come to it to feed. The recipe for moth bait is simple, and not very precise. It’s good to have something sweet, and something that ferments. I use a mixture of brown sugar and old bananas, and I sometimes add a little wine or beer to help it to start fermenting. I mash up the ingredients and let it sit for a day or two before I use it. Using a clean paintbrush, I paint this mixture on some tree trunks that are easy to get to at night. I do the painting during the day, and go back just after dark to check and see what I’ve got. It really helps to pick a series of trees to bait, and then keep using those same trees – I often see more moths on subsequent nights. I refresh the bait every day or two, especially after it rains. Approaching quickly with a flashlight will scare off some of these moths, so I move slowly and cautiously. I start looking from a little distance away, and move the lights slowly up until the moths are lit. I start photographing from too far away, and then move slowly closer until I get close enough to get good pictures. 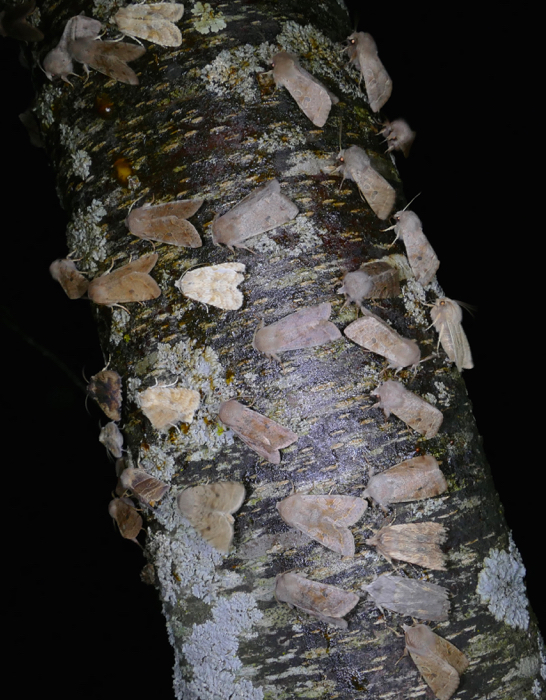 Moths on a sugared tree trunk. This was taken on a very warm night – nearly 70F. On cooler nights there are fewer moths. Since moths on bait are so wary of light, it’s sometimes easier to capture interesting ones and take them inside to photograph. I put an empty pill bottle under the moth, touch it, or tap on it’s head, and it falls down into the bottle. I cap the bottle, and then put it into the freezer for a few minutes to calm the moth down. Be careful not to leave it in the freezer too long or the moth will die. I start with about 5 minutes. That’s usually long enough to give me a few minutes of photographing time before the moth starts to “wake up” again. After I photograph each moth, I release it. I have my best luck attracting moths with bait early and late in the year, when it’s very cool at night. In warm summer weather, the bait doesn’t seem to attract as many moths. Any lights will attract moths at night, especially bright light, and light at the blue end of the spectrum. Checking around windows, porch lights, or street lights will usually yield some moths resting on nearby structures or vegetation. 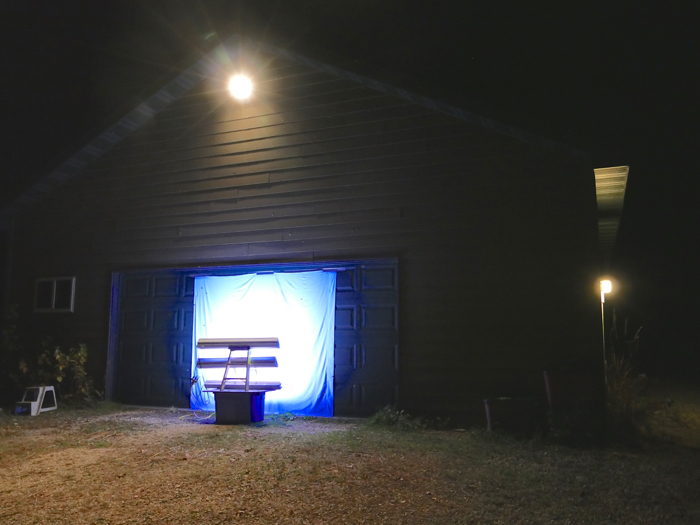 To attract more moths, at a level where I can see them easily, I set up my own lights. Here’s a photo of my set up. I use shop light fixtures, with UV bulbs. I started with the blacklight bulbs that you can buy at Home Depot and Menards. Last year I discovered “white blacklight” bulbs. They’re brighter, so they attract more moths. This is a photo of my whole set-up. I tape a white cotton sheet to our garage door. I have my lights threaded through and on top of a small stepladder, on top of a box – so the lights shine higher on the sheet. I leave the yard light on because I think it draws in more moths from farther away. And the smaller light at the ‘people door’ on the side attracts moths that may not come to the main lights. I set this up at dusk, and come back to check on it once it’s dark. It works best on warm, humid, still evenings with not much moonlight. I start setting up my lights as soon as the evening temperatures get up to about 50 degrees in the spring, and continue until it gets cold in the fall. 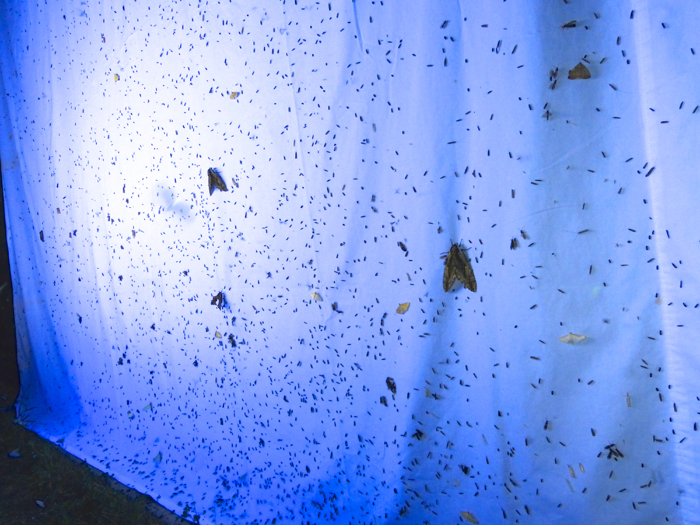 A lot of creatures are attracted to light besides moths – this shows quite a few moths, but also flies, caddisflies, beetles, and hoppers all congregated on the sheet. When I check for moths, I look around the sheet as well as on it. I find lots of moths on the garage door, the walls, and the ground under the lights, as well as on the lights themselves. Some people leave their lights on all night. I don’t – I turn them off when I go to bed. If there are moths there in the morning, the birds will eat them. 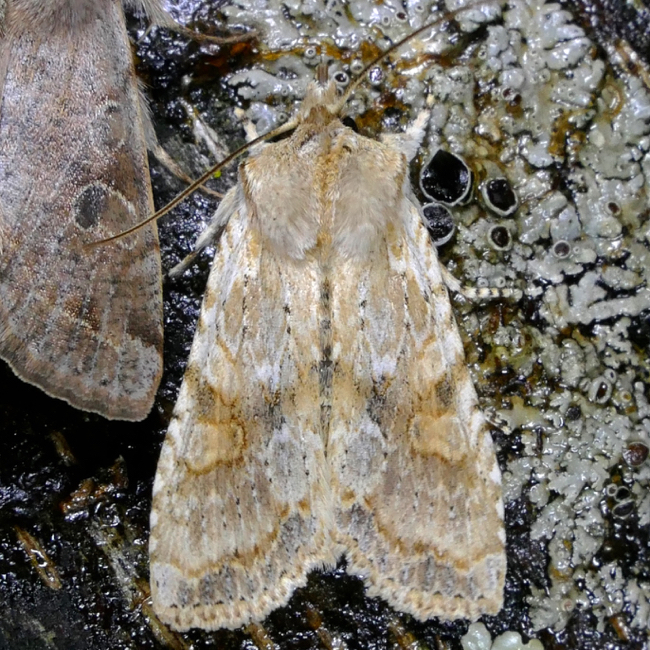 And moths have other things to do at night – they need to eat and mate and lay eggs. I don’t want them to spend their short lives sitting on my sheet. When I’m ready to pack up, I turn off the light, take down the sheet and give it several vigorous shakes. That will usually remove all the moths – they’ll fly away into the dark. 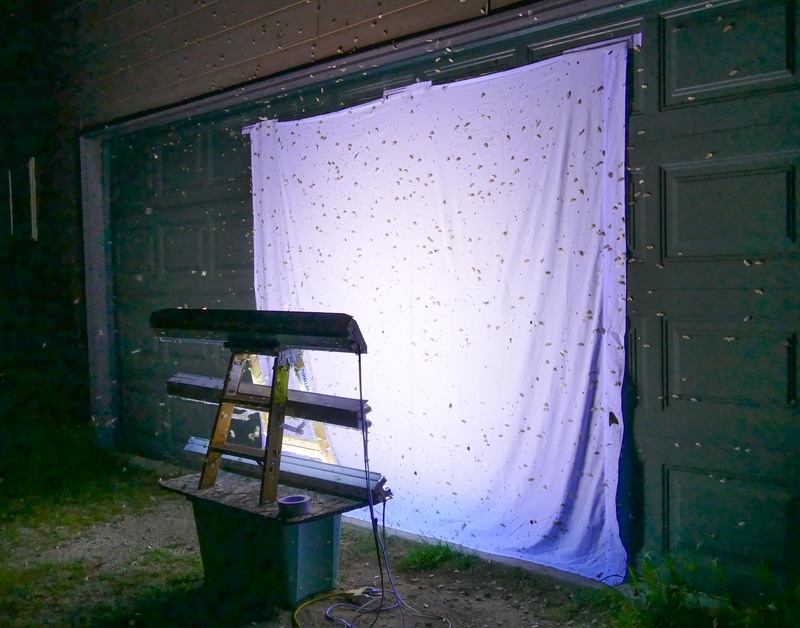 Moths – and caterpillars – have other things to do at night besides coming to lights or bait. And most moths, and many caterpillars, are more active at night than in the daytime. So another way to see them is to wander around with a light and look for them. Black light flashlights are a good tool for finding caterpillars. 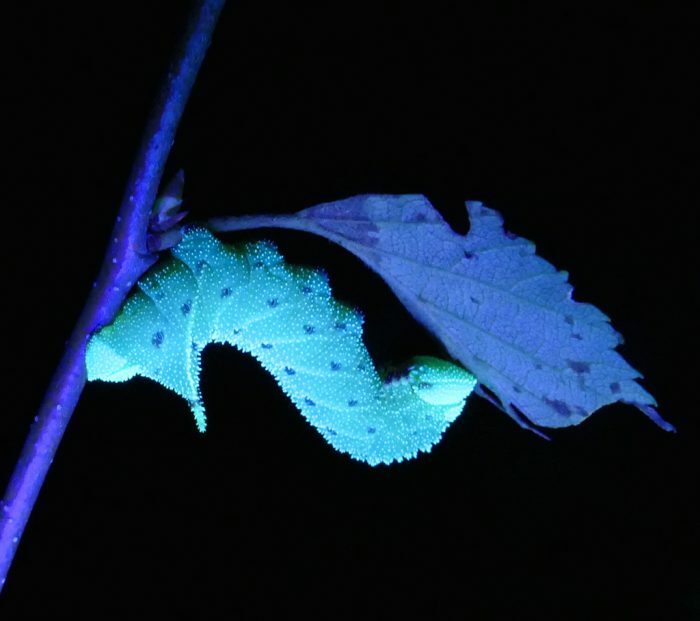 Many caterpillars glow in UV light, so when you shine the light on a clump of plants or bushes, the caterpillars stand out. This is a sphinx caterpillar glowing in the UV light. This is the same caterpillar photographed with white lights. I usually use the blacklight flashlight to find the caterpillars, and then do my photographing with white lights. Another useful kind of light is a headlamp – the kind that runners wear at night. If you wear it as you walk around at night, the light will shine into moths eyes and make them glow. That makes it much easier to spot the moths. Check blooming flowers at night. Many moths nectar at flowers, and some flowers attract even more visitors at night than they do during the day. 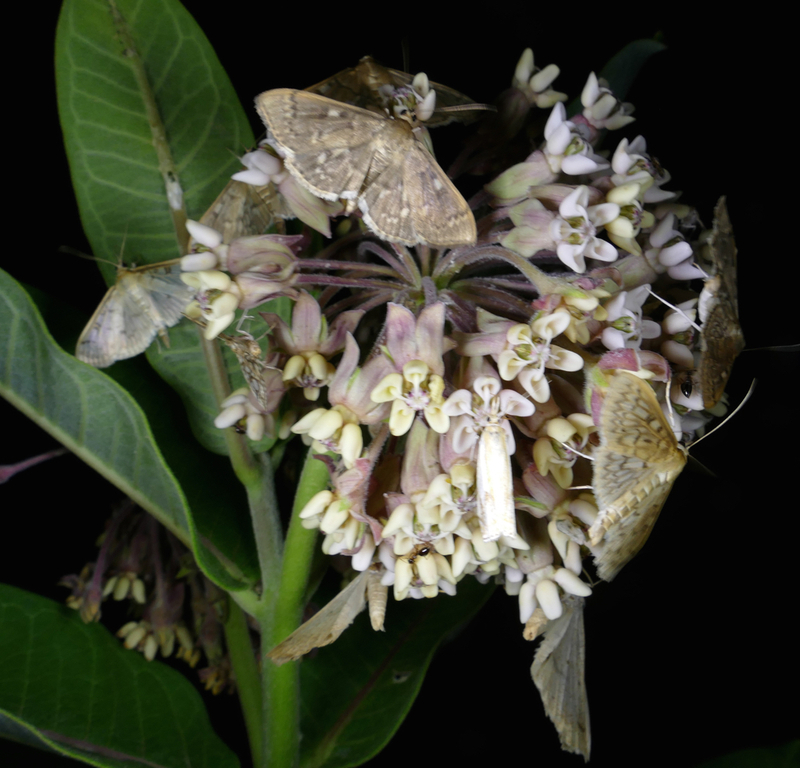 One species that is particularly attractive to small nighttime moths is Common Milkweed. Click Here to see more insects found at night on Common Milkweed. Sphinx Moths are reported to nectar on Evening Primrose at night, although so far I haven’t seen that. When I’m using lights, I photograph the moths right on the sheet. The moths can be startled by fast movement, or suddenly turning on the camera lights, but usually they seem to be “caught” by the UV lights. They tend to stay still on the sheet, or fly around for a moment and then come back. 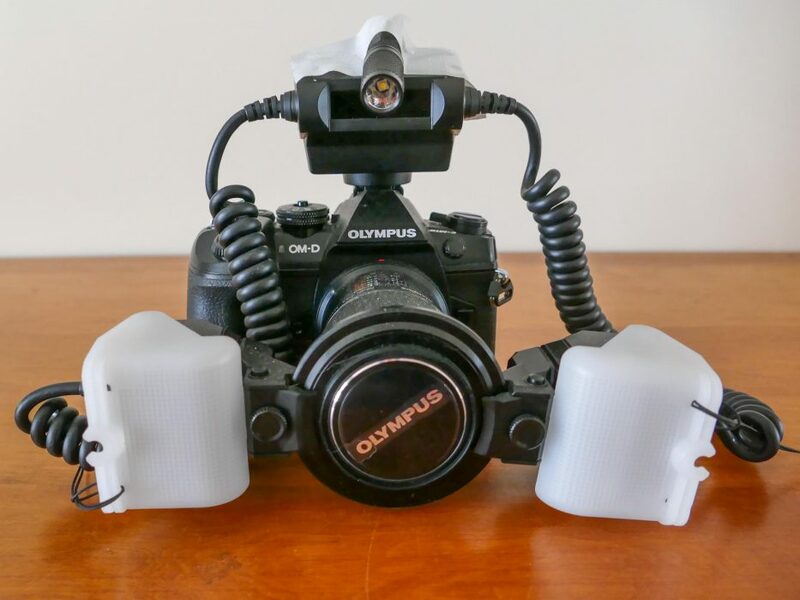 My newest camera for moths is an Olympus E-M1 MarkII with a 60mm macro lens and a flash. The camera has trouble focusing when it’s dark, so I’ve taped a small flashlight to the top of the flash unit to give it some help. The flashlight also helps me see the moths better. The flash unit has two lights that I can position on either side of the lens, to reduce shadows. 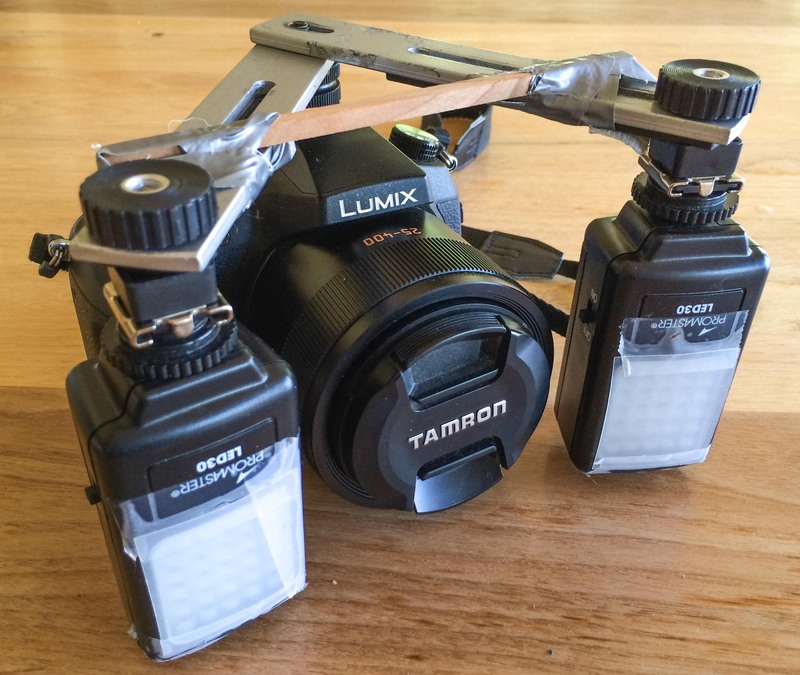 Here’s my Lumix camera set-up. We made it up by hooking together bits and pieces from various camera gadgets. 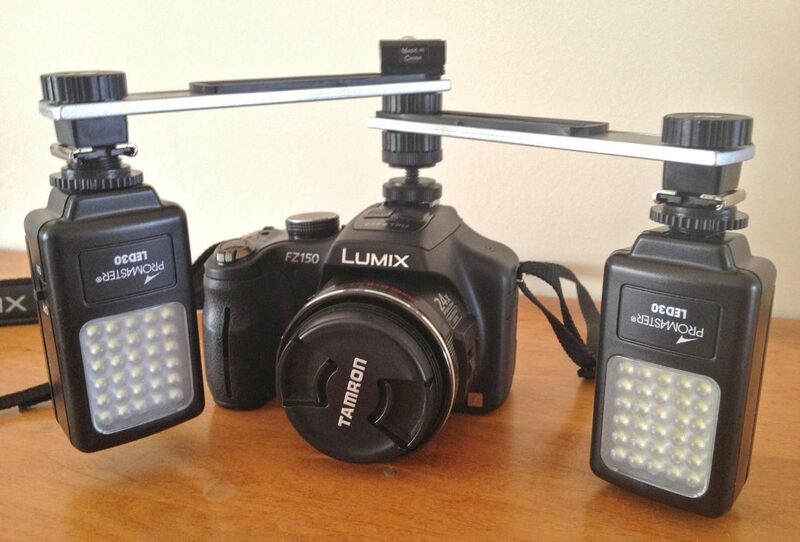 The whole light arrangement is attached to the flash shoe by a male shoe to male tripod adapter. (The flash is turned off, so the fill lights are turned on with switches.) The arrangement is secured on the top by a male tripod to female shoe adapter. We connected the fill lights with a short piece of wood and duct tape so they don’t move around. It’s very helpful to be able to take good photos of the moths. I can’t always identify the moths right away – I need to be able to research them. So it helps to be able to look at a photo, later, to see the details of shape and color and pattern. It’s actually easier to see the details in a photo, than to see them with my eyes. Also, if I need to ask for help with an ID, or post a record to Bugguide, I need to have a photo. And I like keeping a record of the moths I find. One of the most difficult parts of this process is identifying the moths. I use both books and internet sites. Moths & Caterpillars of the North Woods, by Jim Sogaard – great place to check first – has a lot of the most common moths I see here in Wisconsin. Peterson Field Guide to Moths by David Beadle and Seabrooke Leckie – published in April 2012. It has photos of living moths in their natural resting positions. It’s so helpful to be able to flip through pages of good moth photos looking for a match. But it doesn’t have everything, so it’s good to use it for a first try, and then check the online resources. Field Guide to the Moths of Eastern North America, by Charles Covell – originally a Peterson Field Guide, but now out of print, and republished by the Virginia Museum of Natural History. 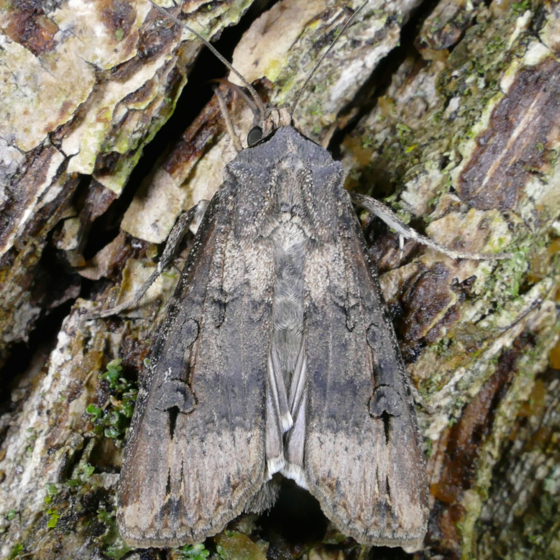 Photos of spread moths, many in black and white, old, not great photos – but a classic reference work on moths – full of information on range, food plants, and distinctive markings. Les Papillons du Quebec, by Louis Handfield – in French, but Latin names are the same everywhere. Photos of spread moths, but all in color and better than the ones in Covell’s guide. 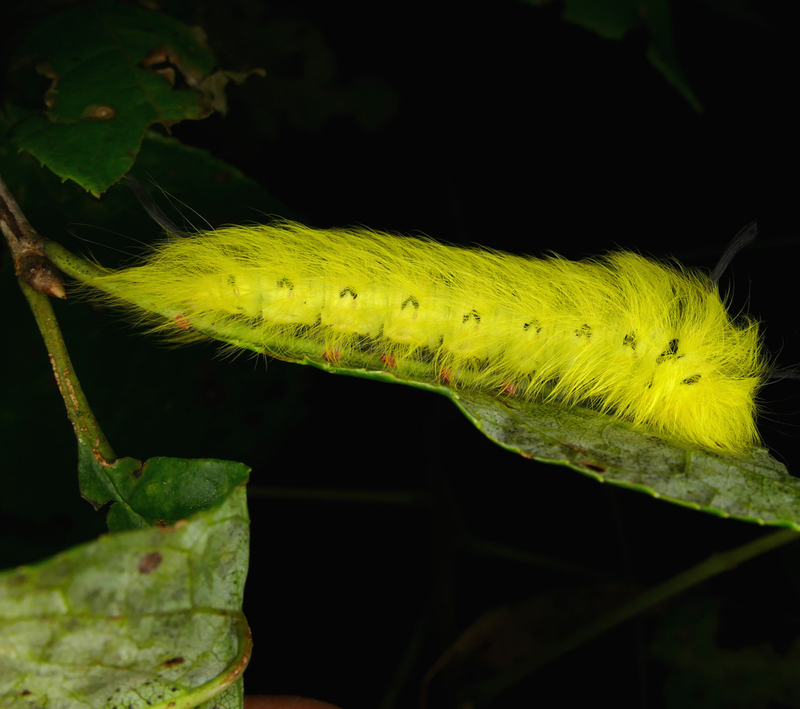 Caterpillars of Eastern North America by David L. Wagner – many of the common caterpillars, their food plants, and information about when and where to look for them. Owlet Caterpillars of Eastern North America by David L. Wagner, Dale F. Schweitzer, J. Bolling Sullivan & Richard C. Reardon – lots of caterpillars of this group of moths – with excellent photographs and information. Bugguide.net – like a Wikipedia for insects of North America. It’s an extensive ‘encyclopedia’ of insects, and a place where you can ask about the bugs you find, and post photos to contribute to the guide. MothPhotographersGroup – extensive listing of moths of North America, with representative photos of each moth, both live and pinned specimens. There are also several Facebook groups for people interested in moths. 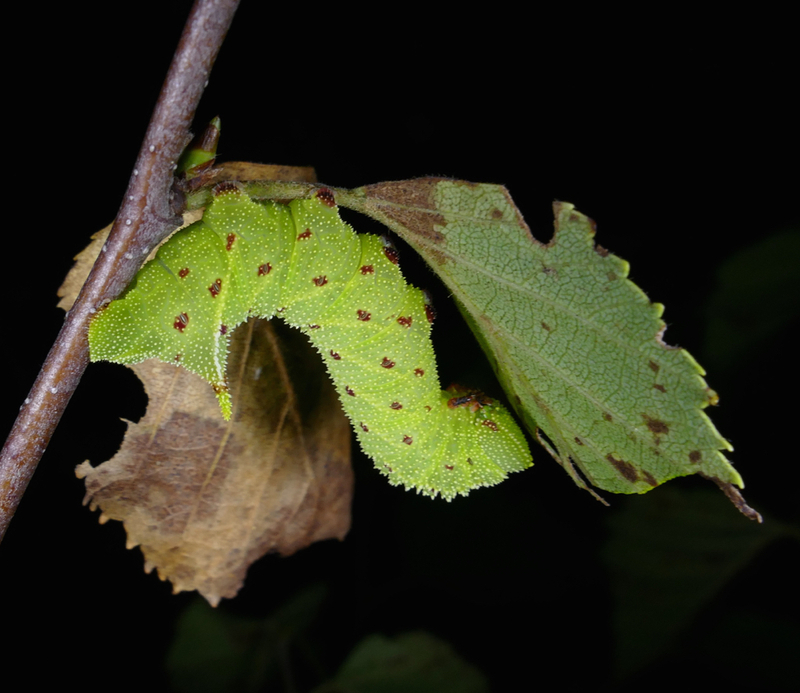 My favorites are: Mothing and Moth-watching, Moths of the Eastern United States, Caterpillars of the World, and Caterpillar Identification of North America. They’re good places to post photos and ask questions, and meet people with a passion for learning about moths and caterpillars. National Moth Week is held the last full week of July every year. It’s a time to celebrate the beauty and diversity of moths. There are events – “moth parties” – held all over the world to observe moths, and to introduce the wonderful world of moths to people who have never seen them. To join in, check to see if there are any events in your area, or hold one of your own. Part of the fun of “mothing” is sharing it with other people who have never seen these wonderful creatures.